As the World War rages, a new giant awakens in the Far East - the forces of the Chinese Federation arise to take a stand against those who would violate its territory. The Emperor’s Aerial forces anchor around the Feilong Sky Fortress, a true feat of oriental engineering. The Feilong is a Massive Class model and on the battlefield its imposing size is only matched by its serene elegance. ... <lire la suite>. ATTENTION ! Ceci est une extension pour CHINESE NAVAL BATTLE GROUP ! As the World War rages, a new giant awakens in the Far East - the forces of the Chinese Federation arise to take a stand against those who would violate its territory. The Emperor’s Aerial forces anchor around the Feilong Sky Fortress, a true feat of oriental engineering. The Feilong is a Massive Class model and on the battlefield its imposing size is only matched by its serene elegance. Around the Sky Fortress zip lightning fast Zhùlóng Small Interceptors, armed with small flame throwers and punishing Ack Ack. In addition the Chi Long Assault Flyers, close in for the kill armed with yet more flame throwers, bomb bays and hordes of Imperial Troops ready to board enemy targets. 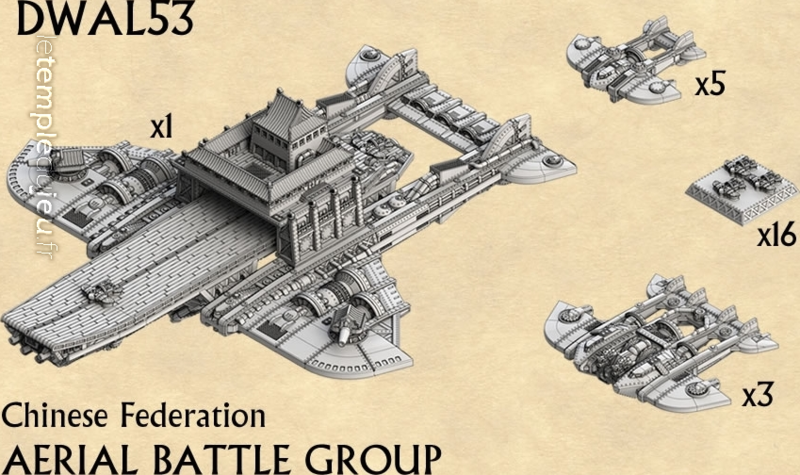 Included in this set : Feilong Sky Fortress x1, Chi Long Assault Flyer x3, Zhulong Small Interceptor x5, SAS Tiny fighter token x16, SAW Fighter Tray x4. Plus TAC card deck, tokens, and templates. Models supplied unpainted and unassembled.